Embrace comfort, warmth and cosiness in your home with our hygge-inspired edit. Relax in the Fritz Hansen Egg Lounge Chair in Leather. In the busy and fast-paced modern world, the importance of contentment can be easily lost within a sea of convenience, drowning amongst to-do lists, schedules and large amounts of disposable commodities. That’s why living by ‘hygge’ can help us lead a happy and fulfilled life. Pronounced as ‘hoo-ga’, this familiar Danish concept is hard to describe in just one word, but ‘cosiness’ definitely fits the bill. From enjoying laughter with friends and family over a candlelit dinner, to reading your favourite book on a relaxed Sunday morning, hygge is all about feeling comfortable and happy. It’s about appreciating the little things and not just deferring happiness to big events like holidays and buying a new car. Entertain with the Ferm Living Neu Pitcher and the Tom Dixon Etch Tea Light Holder. Credit: Pinterest / 1. The little things that can make us happy are all around us, so creating a home that is comfortable, practical and full of personality is a big step towards getting more ‘hygge’ in our lives. As a reaction to the cold and dark Nordic weather, Danish design channels hygge with its constant focus on warmth and homeliness, making the home a sanctuary of comfort and personal expression. Build your sanctuary. 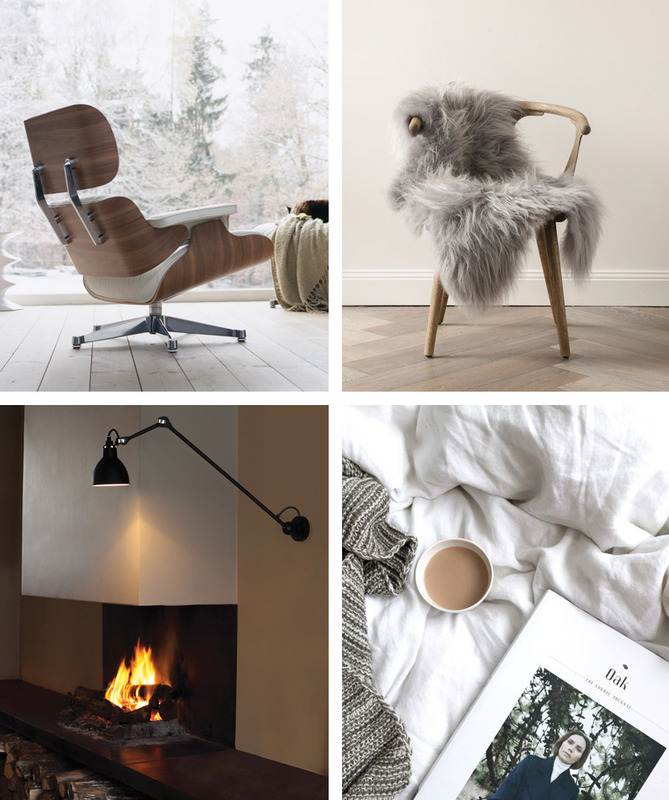 Vitra Eames Lounge Chair in white, Carl Hansen CH24 Wishbone Chair, DCW Editions Lampe Gras 304L60 Wall Light. Pinterest 1, 2. To take a leaf out of the Danes book, invest in design that is not only stylish and beautiful to look at, but also liveable, functional and designed to last. There’s no point in buying something you love if you can’t use it, or if it’ll fall apart quickly. That’s why we’re so committed to supporting original, authentic and high-quality design, that has been built with the intention of improving quality of life and wellbeing in the home. So, snuggle up by the fire and make a home that will be a warm embrace after a long, stressful day. For all things beautiful, comforting and hygge-inspired, browse and shop our special edit below. 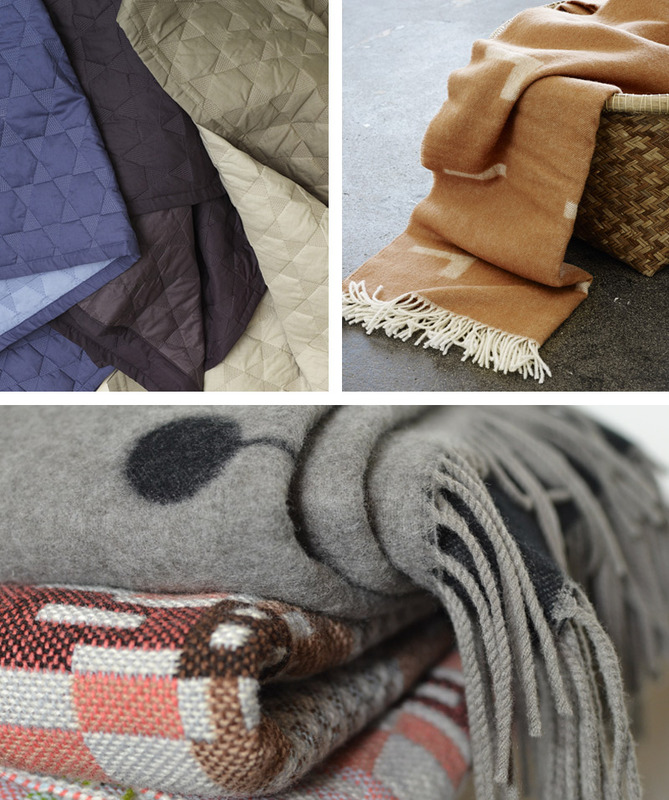 Snuggle up with our selection of throws and blankets. Pictured is the Hay Polygon Quilt, the Skagerak Iota Blanket, the Vitra Eames Wool Blanket and the SCP Nos Da Throw. Shop the edit below for featured products. For help and advice on any of the featured products, please email info@nest.co.uk, call 0114 243 3000 or get in touch on Live Chat.